Often our android phones may get warning that “Phone storage is getting low” because your apps dont have space to be installed on the phone. I too had this problem. Then I found out the answer, after doing this all apps installed will go to the sdcard. Now you need to download and install the Android SDK on your computer from http://developer.android.com/sdk/. Once you’ve downloaded and extracted the package to the folder of your choice, Click and run SDK Setup.exe and click on Available Packages to the left. If you get an error message at this point, enable “Force https://…” in the Settings. From the list of available packages, select “Usb Driver package”, click on the Install Selected button in the bottom right corner and follow the prompts. Connect your phone to your computer with a USB-cable. Your OS will prompt you to install new drivers. Choose to install them from the android-sdk/usb_driver folder. Do not mount your device; you only need to plug-in the cable. Next, if you are on windows open the command prompt by opening the run console and typing cmd. Navigate to the Android-SDK\tools folder. and it should detect your connected device. adb shell pm setInstallLocation 2.
and , you’re done! Android will now install apps to the SD card by default. 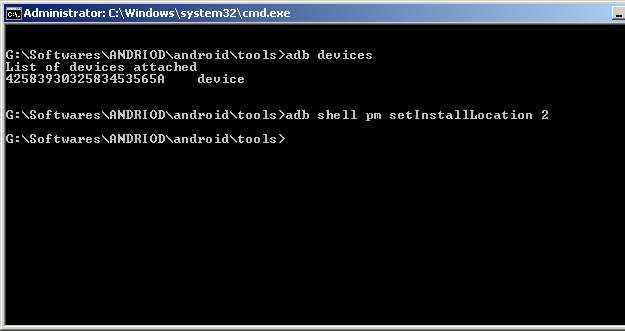 adb shell pm setInstallLocation 0.